I'm not sure how I missed Alan Gratz's work before, but I have definitely fallen in love with his books this year. Yesterday I read PRISONER B-3087, a historical fiction novel based on the true story of Jack Gruener. Yanek Gruener was a Jewish boy, living in Krakow, Poland, when it was taken over by the Germans in 1939. If I had known what the next six years of my life were going to look like, I would have eaten more. I wouldn't have complained about brushing my teeth, or taking a bath, or going to bed at 8 o'clock every night. I would have hugged my parents and told them that I loved them. But I was ten years old, and I had no idea of the nightmare that was to come. None of us did. In the beginning, Yanek and his parents survive by hiding in a pigeon coop on top of their apartment, but ultimately, Yanek's parents are captured, and then he is. Yanek spends time in ten different camps, survives beatings, numerous trips in cattle cars, and two extended marches. Somehow he maintains the will to live. I loved this story, and read it one sitting. It's an intense read, though, and I'd definitely read it myself before recommending it to kids. Kids younger than middle school may or may not be ready for the content. I'm struck, regularly, by the number of important things I really should know more about. The Children's March is one of them. The March, was planned by Reverend James Bevel, Reverend Fred Shuttlesworth, and Dr. Martin Luther King, Jr., for 1963. The trio had originally asked adults to protest segregation laws in Birmingham, Alabama. Their goal was to make the jails so full that police would have to stop arresting people. Adults didn't want to participate in the protest for fear of losing their jobs, or being evicted from their homes, or beaten by police. Bevel, Shuttlesworth, and King finally decided that instead of using adults, they would have children march and fill the jails. 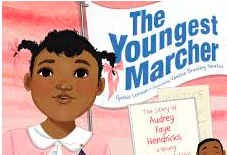 THE YOUNGEST MARCHER is the story of Audrey Faye Hendricks, who put on a "fresh pressed pinafore and shiny Mary Janes with turned-down socks" and joined the march for freedom. She was arrested and spent an entire week in juvenile hall, eating oily, soupy grits and slipping on a cot with one thin sheet for a cover. After 5 days, the jails were full of children, and the march had achieved it's desired results. "Watching television in the dayroom, Audrey saw black people stroll straight into stores and restaurants like they belonged there. And two months later, the City of Birmingham "wiped segregation laws clean off the books." An important story of advocacy for readers of all ages. The seventh grader's voice is insistent. "I stay today, Miss. Don't you remember I stay on Fridays?" I am more than a little surprised. It is true that back in October, at parent teacher conferences, his parents and I agreed that he would stay twice a week for tutoring. And Fridays were supposed to be one of those days. But he's only actually stayed once. The week after we made the plan. At first I tried to track him down, but then later, I have pretty much just let him go. Tree months later, his mother knows he isn't staying, but that the offer stands. And today he wants to stay. I wonder why. He accompanies me to my outdoor duty at the end of the day. I expect he will run off to kick a soccer ball with his friends, but he stays next to me the entire 15 minutes. And again I wonder why. Afterwards we go back upstairs. We look at an account for a reading app we installed on his phone when he stayed in November. He has used the app to read over 300 pages. He is using it to read the district's required novels, but he is also using it to help him read a James Patterson novel. He likes it, and asks me to download more from the same series. I gladly oblige. We go down the hall to share his good news with some of the other middle school teachers, the principal, and the assistant principal. He asks if I will call his mom, then his dad, to tell them about his success with the app. I gladly oblige, limping along in my very bad Spanish. I ask him if he wants to read now. He doesn't. Again I wonder why he wanted to hang out with me on a sunny Friday afternoon. I ask if he wants to help me change some bulletin board paper. He does. The bulletin boards at my school are all very old, made of plaster. You have to use tape, lots of tape, and pray that the paper will stay. We work for almost half an hour on that project. I dig money out of my purse and buy him a Coke. Then I go on to do a little book repair. E stays for that project too. He shows me a fitness app on his phone, and tells me that he is jogging every night, trying to lose a little weight. I show him my Weight watchers app. Finally, 90 minutes after school is over, he decides it's time to leave. I still don't have any idea why he decided to stay and wallow in an old lady reading teacher's ordinariness for an hour and a half on a Friday afternoon. And maybe it doesn't matter. And all readers grow better with a little extra attention. 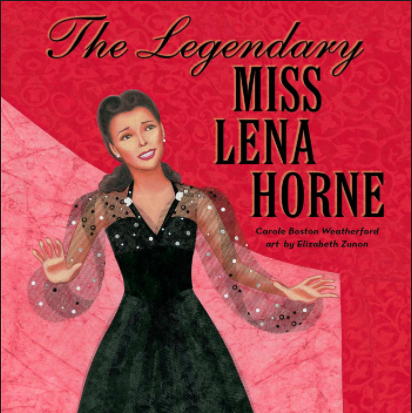 Today, on Martin Luther King Day, it seems appropriate to review two picture book biographies. These women are well-known entertainers, but perhaps they should more famous for their roles in the Civil Rights movement. 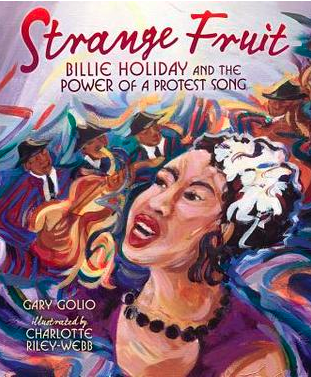 Gary Golio's picture book, STRANGE FRUIT: BILLIE HOLIDAY AND THE POWER OF A PROTEST SONG is definitely a picture book for older readers. Billie Holiday lived a sad, sad life. As a baby, she was left with an older half sister for years. At ten, she ended up in a reform school because something was done to her. When she was 14, she moved to NYC to live with her mother, and they both ended up in jail. Billie knew she wanted to be a singer. She sang at small clubs around New York, and then was booked for larger engagements. She endured much protest, not being able to walk around in the clubs, having to use the service elevators, having to sleep on the tour bus. Billie finally ended up at the Cafe Society, a club created especially for blacks by Barney Josephson. At the Cafe Society, Barney was contacted by Abel Meeropol, a Jewish teacher from the Bronx. Meeropol, outraged by a photo of a lynching, wrote the song "Strange Fruit. Barney Josephson thought that the song was important, and asked Billie to sing it. Here is a link to a recording of Billie Holiday singing "Strange Fruits." End matter includes "What Happened Next" as well as a biography of Billie Holiday. Charlotte Riley-Webb's oil illustrations are colorful and strong and vibrant. introduced as Cuban rather than African American. MGM offered her the first ever contract as a black actress, but the NAACP wanted her to take a stand, and Lena refused to play the role of maids or mammies. Ultimately, she was cast mostly in singing roles that could be easily edited out in the South. She appeared with Medgar Evers and sang "This Little Light of Mine." He was killed just a few days later. At the I HAVE a Dream Speech she spoke one word into the microphone- FREEDOM! These women's fight for freedom is definitely one our students should know about! Today, I'm sharing Edna St. Vincent Millay's "Counting Out Rhyme." I'm sharing it because I just finished listening to an extraordinary book, ROSE UNDER FIRE by Elizabeth Wein, and I can't wait to share the book. Edna St. Vincent Millay's poems feature prominently in the book. I'm thinking maybe some of you who love poetry might also love this book. ROSE UNDER FIRE is the story of Rose Justice, a teenage girl from Pennsylvania. Her father taught her to fly an airplane when she was twelve, and she graduates early from high school so she can join the Royal Air Force in Britain during WWII. Women are not allowed to be fighter pilots, but she ferries planes from one country to another. On one of her trips, she is captured by two German planes and forced to land in Germany. She ends up in Ravensbruck, where she is befriended by a group of Polish known as the Rabbits. The Rabbits have been the subject of horrible, horrible medical "experiments" by the Nazis. The book actually ends after the war, when some of them testify at the Nuremburg Trials. I'm sharing Edna Saint Vincent Millay on Poetry Friday because Rose is a lover of poetry. She recites Edna Saint Vincent Millay's poems throughout the book-- when she is laying on her stomach after two brutal beatings, when she is standing in endless roll calls, and after a Polish woman, Roszcika (I'm not sure I am spelling her name right because I listened to the book, I have never seen the print copy) promises an extra slice of bread for every poem she will recite. Rose also writes poetry to make sense of her experience, and Rose's poems are included throughout the book, which is told in the format of a journal. ROSE UNDER FIRE is a really dark book and it's sad and hard to listen to. 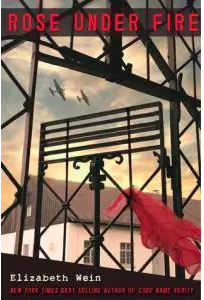 Ravensbruck was the scene of horrible atrocities, and Elizabeth Wein doesn't sugarcoat them, at all; but it's also an incredible book about the power of poetry to help and to heal, and the power of friendship, and kindness and the human spirit. I loved the audiobook and I think other poetry lovers might love it too. POETRY FRIDAY is at Bookseedstudio today. I love being a CYBILS judge, because I always learn new things. This year, for example, I learned about Toyasoburo (Fred) Korematsu, an American hero who I am ashamed to admit had never even heard of. 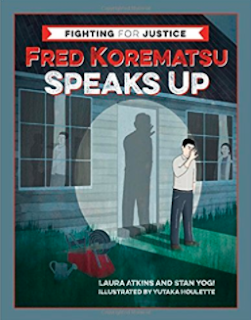 The book, FRED KOREMATSU SPEAKS UP made it to the CYBILS nonfiction finalists. I hope it wins! Toyasoburo Korematsu, born in 1919, was the third son of Japanese immigrants, who had moved to the United States in 1905. His first grade teacher could not get her tongue around his first name, and so Toyasoburo became Fred. When Korematsu was 23, all persons of Japanese heritage were ordered into internment camps. Fred refused to go, and was arrested and thrown into jail. While he was imprisoned, Korematsu was visited by the ACLU, who asked him to allow his case to become the test case to challenge the constitutionality of the government’s imprisonment of Japanese Americans. The case ultimately went all the way to the Supreme Court. Korematsu lost, but forty years later, new evidence was uncovered and Korematsu was pardoned. In addition to a compelling story of a horrific injustice, an interesting aspect of this nominee is the format. The book alternates between sections presented almost as a novel in verse, followed by other sections that read like a more traditional nonfiction text with photographs, propaganda cartoons, and timelines. A fascinating presentation of a true American hero. And so it happened again on Saturday. I have been going to Weight Watchers for almost a full year. I hit my goal weight in October and made lifetime in November. When you hit lifetime, you only have to weigh in once a month. Even so, I go to the meetings and weigh in pretty much every single week. The accountability and consistency work for me. My WW leader is a Stanford graduate in her early 50's, mother of two college-aged sons, a mountain biker. She's high energy, really funny, and really honest about her own weight loss struggles; we all laugh every week as she talks about the"snack-cidents" in her own life. Her strengths as a leader are evidenced by the number of people that roll out of bed to make it to her meetings every Saturday morning at 7:30. She's really good. But she doesn't know my name. The doors at Weight Watchers open half an hour before the meetings start. People stand in line (really long at this time of year), and wait to weigh-in. While we are waiting, the leader works her way down the line, greeting people, answering questions and making name tags. Saturday I stood in line in front of a really nice guy named Josh. He usually comes with a baby and I commented that she wasn't with him today. He said she was sick. We made small talk-- his wife is a baker and he is currently surrounded by five kinds of cupcakes. I found out he's a teacher, working with high-risk high schoolers. And he posts killer recipes on the WW Facebook page. And then the leader got to us. Josh was standing behind me, but she made his name tag first. And then she looked at me. And I knew what she couldn't remember my name. Most weeks she responds, "I should be able to remember that, my mom's name is Carol." And we both laugh. Today I said it for her, "Just like your mom." And she kind of laughed and wrote out my name tag and moved on. And it's really not that big a deal. I have been going faithfully for a whole year. I'm not a super verbal participant, but I show up and weigh in and sit through the 30-minute meeting pretty much every week. And my leader knows lots and lots of people's names, but after fifty weeks, and even though I share a name with her mom, she still doesn't know mine. And it bothers me just a little bit. I wonder why I'm not memorable to her. And I'm an adult, with a reasonably well-established sense of self. There are lots of other people in my life who do know my name and love me and take care of me. But my WW leader doesn't know my name. And the whole experience says something to me. I'm a literacy coach and interventionist. I work with about 400 kids a week. I've always made it a practice to know kids' names. To talk to them and to acknowledge them as human beings. But over the last couple of years it's gotten harder. I think my memory really isn't as good as it used to be. But I need to keep working at it. Knowing kids' names really, really matters. This is a super fun book nonfiction book, but also, maybe a really important book in this time of "fake news." The book is divided into nine chapters, e.g. Crazy Plants, Creepy Plants and Fungi, Small, Medium, and Large Animals, and Humans. Each chapter has three really weird story/articles, accompanied by photographs, maps, diagrams, and all of the features you'd expect in a terrific nonfiction book. "Small Animals," for example, includes a story about the African threadsnake, an animal that lives inside of the ear canal of African wild dogs. There's also a section about the Chelifer cancroides, a microscopic arachnid that lives on dust mites, beetle larvae and book lice, a creature that lives on the starchy glue of book bindings. And there's a section on the common European limpet. Their teeth are the strongest biological material ever discovered. Scientists believe that this material might have important implications for manufacturing and building. Now here is the catch. Two of these creatures are real. One is a total fabrication. It's up to readers to use whatever tools they can to figure out which one is false. And they are not particularly easy to figure out. The book includes lots of other related short articles and side bars. One of my favorites was a section called "Fake or Fiction," a list of ten weird "facts," nine of which are true and one which is false. Really fun! 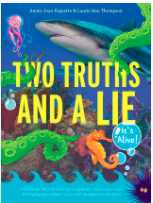 My middle schoolers love this book. It's overdue at the library and I need to return it. I'm going to go buy it, because I know they will be looking for it when they come back to school on Monday. I've heard that this may be the first book in a series, and I'm hoping that's true! It's terrific! Confession: I. HATE. THE. DENTIST. No, I mean really hate it. As in DESPISE. ABHOR. I think it's because I'm afraid. I trace my fear of the dentist back to Dr. Johnson. We went to him when I was a little girl. He had a treasure basket with plaster of paris figurines that you could bring home and paint. I loved those. But to get to the treasure chest, you had to survive his antiseptic smelling hands. And the fact that he filled cavities without much novocaine. And it hurt. Like crazy. After that was Dr. Moore. A pediatric dentist. Who made us chew these vile tasting pink tablets. When I graduated from college, I pretty much vowed I was never going to the dentist again. And I didn't, for about five years. Then I got a toothache. And had to start again. And I actually found a dentist I loved. Dr. Schindler was about my age. She had two dogs, bearded collies, that were trained therapy dogs and came with her to the office every day. She understood that I was terrified. For twenty-five years, we laughed about my white-knuckle experiences in her chair. We went through her experiences with breast cancer, marriage and divorce. And my adoption and life with the boys. Both of our aging parents. And then she retired. Unexpectedly. Her mother's health was failing and she moved to Idaho. When it came time for my next appointment, I tried making an appointment with the person who had taken over her practice. And was so unimpressed with the person who answered the phone that I decided to find another dentist. I checked the neighborhood website and chose a dentist close to my house. The practice came highly rated and highly recommended. Today my appointment was at 7:30. I make the appointments early to get them over with. Get up. Brush my teeth. Go. And in an hour it's over. Today I had a nice visit with the hygienist. She's from Saint Louis. Moved here two years ago. Lives with her boyfriend who is also from Saint Louis, but who she met online after she moved to Denver. Went home for a week for Christmas. Drove so she could take her dog. And then the dentist came in. She was very nice. Told me my teeth looked fine. But that I had a few old fillings and crowns that would need to be replaced soon. She wanted to make a plan. I wanted to know if it was absolutely necessary. And how much it would cost. She wanted me to come back so we could work up a plan. I asked again if it was necessary. She said no, that I could wait until something started to hurt, or until I had problems. I told her that that was what I was going to do. She looked a little surprised. I don't think she is used to people waiting until they have problems. And I am not going back, until I absolutely have to. Welles Crowther was a junior associate at Sandler O'Neill, working on the 104th floor of the World Trade Center on September 11, 2001. He didn't survive. However, in the days following, his parents began to hear stories about a young man who had led many others to safety. The man was described as Anglo, slightly built, very short hair, and most importantly, wearing a red bandanna. The Crowthers knew this was their son, Welles. Since he was a very little boy, he had talked of following his two grandfathers' career path as firemen. 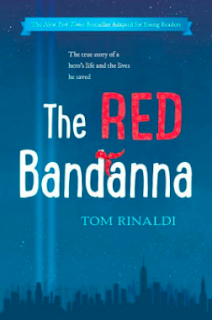 And since he was a very little boy, he had carried a red bandanna handkerchief in his back pocket almost every day. This short novel, based on a longer adult book, tells the story of a 9-11 hero. You can also watch a video about Welles here.